We are pleased to announce the participation of la fondation de l’héritage du transport en commun du Québec. 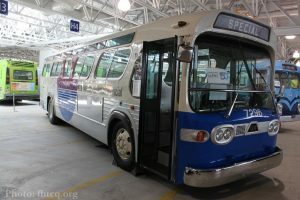 The FHTCQ will present a bus, well known to the citizens of Ste-Anne-de-Bellevue, the GM New Look 1965. This bus served the community long before the STM.